The largest annual light construction building show in the world will take place in “fabulous” Las Vegas, Nevada, January 22nd-24th. At the show, Hearth & Home Technologies will be bringing the heat with more than 20 products on display. At center stage is the NEW Heat & Glo® REVO series. Available in square, linear and vertical styles, these modern beauties are the thinnest AFUE-rated fireplaces ever made. No footprint and no need for an exterior chase makes installation of these showstoppers stunningly simple. These slender models quickly fill their compact fireboxes to produce impressive heat output into the room—up to 24,000 BTUs—more quickly than other gas fireplaces on the market. Flames elegantly rise through an invisible and patented Razor™ burner. Reflective black glass interiors add intensity and depth resulting in a truly unique and beautiful fire. Other must-see modern styles on display are the award-winning, circular, Solaris gas fireplace, that features an “infinity flame” (it looks like it “dances into infinity”) and the first-ever modern, indoor/outdoor fireplace featuring chic glass media and artistic flames. 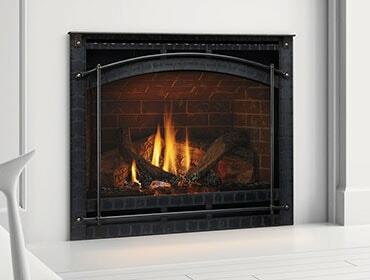 Hearth & Home Technologies is also unveiling a NEW line of electric fireplaces. The brand, SimpliFire™, is focused on providing ease, flexibility and ambient comfort to homeowners. Electric fireplaces do not require any venting—making installation easy at any point during the home building or remodeling process. Two SimpliFire™ electric units will be unveiled and on display. The first is a traditional model that features a textured masonry-style interior, detailed log set and clean face finishing, which completes the appeal of this classic unit. The second unit creates a distinct contemporary look with colored LED backlighting featuring nine different colors and a choice of either glass media or stones that line the base of the firebox. Both units quietly produce up to 4,800 BTUs. Other products on display include an EPA certified wood-burning fireplace along with other industry best-sellers. Make sure you stop by booth #C6115 to see the spread of beautiful fireplaces in action. And be sure to connect with Heat & Glo and Heatilator to make sure you don’t miss anything - we’ll keep you posted with photos, videos and images live from the show floor. Need more information about new products or Hearth & Home Technologies at the International Builders Show?